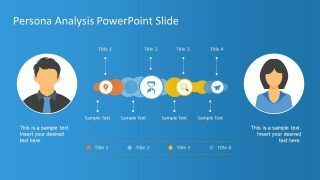 The Persona Analysis PowerPoint Template is a two-slide presentation, encompassing goals and behavior of people. A persona analysis could be performed for user, customer, or buyer. It aids to outline an idea of a user-type which may help in selling the company’s product/service. Persona analysis aids as a blueprint to create a highly-relatable content and target specific needs of people. The PowerPoint of persona analysis displays the 4 steps horizontal process between two users. This template provides silhouette of both genders, giving flexible options for product type. In this way, users can simply select the most suitable human silhouette clipart for their presentations. Further, these human silhouette clip arts portray a buyer and seller persona for company’s products and services. 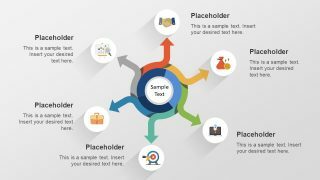 The Persona Analysis PowerPoint Template is a 4 steps diagram to create a user type for a brand or product. This may include persona image, attributes, goals, skills, behaviors/desires, character, and demographics. 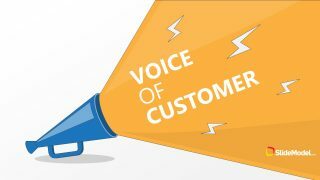 While creating a valuable persona analysis, the professionals brainstorm and develop a list of the customer’s primary issues. These primary issues are often called the pain points. The techniques of persona analysis are widely used in technology applications and advertising. 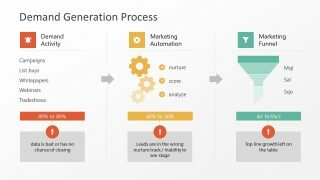 These techniques are helpful in establishing goals for brand by considering the desires and limitations of its buyers. 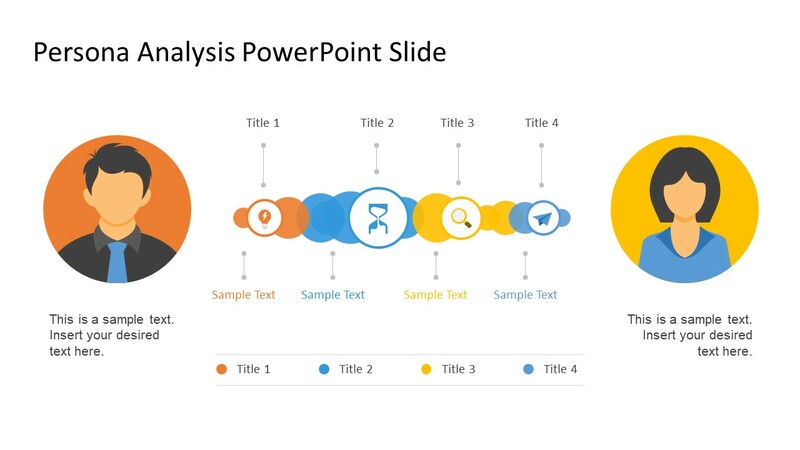 The PowerPoint template of persona analysis shows the 4 steps in horizontal path and silhouette users clipart on both ends. 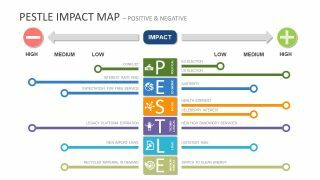 The professional layout of persona analysis contains two color themes i.e. white and blue to choose from. And, the slides contain editable vector graphics and text placeholders. In this way, the presenter can save a lot of time on creating attractive slides. Today’s market is mostly online, therefore, persona analysis PowerPoint can be used to demonstrate a user-centered design process. The persona analysis also captures the goals, abilities, and skill set in any given environment.